We are expecting heavy snow again this weekend, nothing spring but winter. Snow from last weekend still remains on places where sun doesn’t shine in Tokyo. Still, when we go out shopping perishable foods, we do find things that are those of spring, not winter. This season is the last season of Risshun which day by day, we should be, soon expecting warmer day. The season’s phrase focuses on the frozen surface of water outside. It is hard to find water outside frozen all day in Tokyo but if you go out in high altitude countryside, like in Yamanashi prefecture, not so far from Tokyo, you may find ponds and lakes with frozen surface. ‘Uo’ is a Japanese noun for fish which lives beneath the frozen surface of the pond or lakes which cannot be seen when the ice is thick but gradually becomes visible when the ice starts to get thin from the temperature rise. The next Japanese word is followed by ‘kori-wo’ meaning the ice with nominative particle, pointing the verb at the very last of the phrase, ‘izuru’, meaning getting out or coming out. Therefore, the whole phrase says, fishes break out of ice, meaning that the fishes now could break out the surface of frozen pond / lake as the ice got thinner from the temperature rise of spring. A scene of spring’s arrival which unfortunately cannot be seen in big cities though we can imagine, hoping that it will soon be warmer, even when we are still expecting snow like this coming weekend. 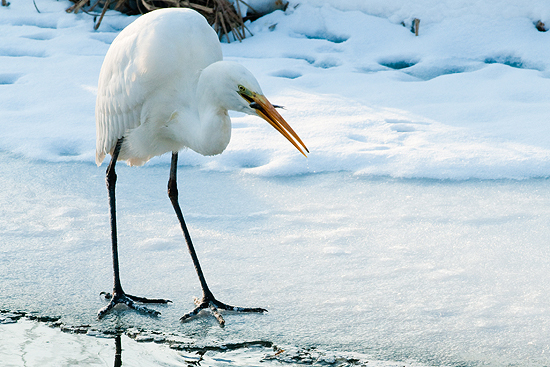 Egret catching fish by the frozen water. 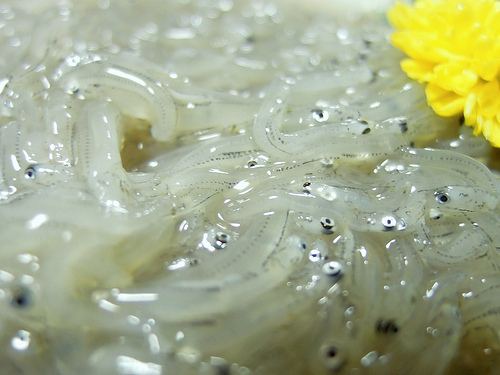 At the maximum size of about 10cm, the tiny Shirauo, known as NoodlefishW or Icefish in English, has another elegant name as ‘Haru-tsuge uo’, meaning fish which indicates spring. Shirauo has been a special spring fish in old Tokyo, Edo, when the first ShogunW, Tokugawa IeyasuW assigned this tiny fish as ‘Otome-uo’, a fish which could be caught only for Shogun’s cuisine by authorized fishermen in Tsukudajima, where tsukudaniW was first made, while Tokugawa Ieyasu was alive. Sashimi of Shirauo. ‘Shirauo-no sashimi‘, photo by Toshio Gamo. There are several views being spoken of why this tiny fish became the special fish to Shogun. One is said to be that the fish was Shogun’s favorite that he wanted to monopolize it. Another is said to be that the fish has a minute pattern on its forehead which looks very much like the family crest of Tokugawa family. For either reason , Shirauo was put in special lacquered container when transported into Edo castle. While transporting this container to Shogun, the fishermen were allowed to go across, or even block any daimyoW’s procession when normally with the commoners, if they did the same, could be cut with the daimyo samuraiW’s sword for their rude manner. 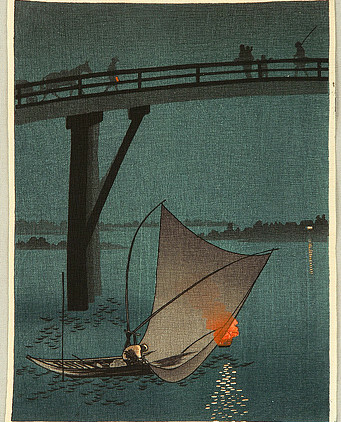 Shirauo fishing with typical net. Spring scene of Edo bay. Drawings by Yoshimune Arai. Shirauo was indeed a special fish which trace could be seen at one of the shrine still existing near Haneda AirportW, Shirauo Inari Shrine. 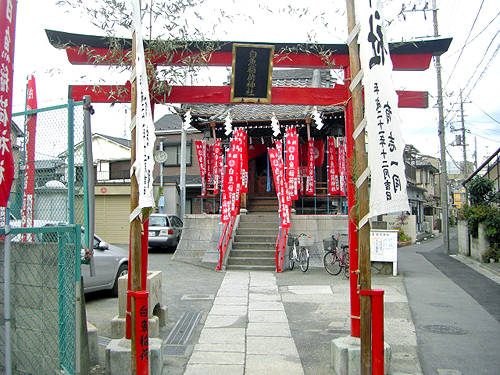 The Shrine is said to be the place where authorized fishermen offered Inari god the Shirauo as token of their harvest gratitude. Classical Shirauo fishing today in Wakayama prefecture. 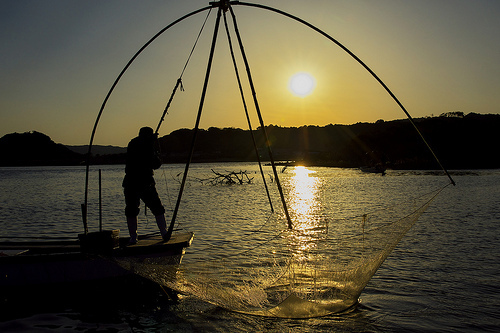 ‘Shirauo fishing in sunset‘, photo by Masahisa Uemura. Shirauo Inari Shrine located near Haneda Airport. Photo from ‘Kimama-ni ikou!‘. It was after Tokugawa Ieyasu’ s death that the ban was removed and others could taste Shirauo. The fish became spring’s specialty of Edo and popular though it was expensive. The fishing of Shirauo by using special net stretched on four poles became a typical scene in spring on Sumida RiverW or on the shore of Edo which you could still find in some of the famous drawings by ukiyoeW artists. There were yakatabuneW, Japanese houseboats, to enjoy both fishing and eating which was one of the effective measures dandies used for their courtesans. There is an idiomatic expression in Japanese to applaud the beautiful hands of women which the dandies could have used for their courtesans as ‘Shirauo-no youna te’, literally meaning hands like Shirauo, which is an expression for slender white hands. 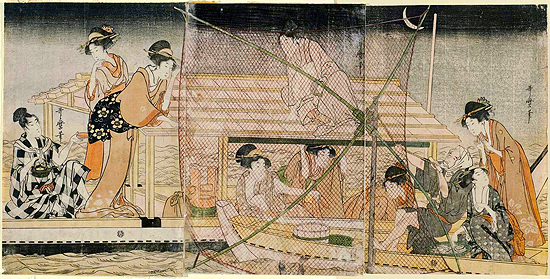 Courtesans having fun with their patrons on houseboats with typical fishing net. Shirauo means ‘white fish’, named after its appearance. They are transparent but turns white in a short time after taking them out from the water. It could be eaten as sashimiW, sushiW, deep fries or in soup which is one of the local menu on HinamatsuriW, a girls festival in 3rd March, in Tokyo. The Shirauo you could taste in Tokyo is unfortunately not from Tokyo Bay anymore but from KasumigauraW, Ibaraki prefectureW. 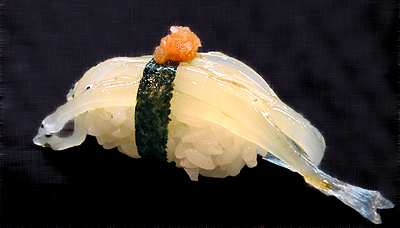 Sushi of Shirauo. A must-try if you ever visit Japan in spring.